-----When one is a wanderer who loves the water and the mountains, how do you choose where to do your wandering? Difficult question. Easy answer. -----We were born with wayward souls. Unavoidable - we suppose it's from the immigrant genes of our ancestors. Our wandering spirits seek uncertainty. Driven by insatiable curiosity, we become restless after a few days or weeks in one place. There's an infinity of new places and experiences to savor. There are new people to meet, new foods to taste, new rivers to explore, and yes, another mountain to cross. Life is brimming with unending variety to discover and investigate. Thus, we are wanderers. A westward wind tugs at our souls, and we can't resist. A map is a siren call. One phrase has never crossed our lips - "I'm bored." -----For us, a house and material things are anchors. We have cut those lines. We follow the lure and it has been a marvelous life. -----Since we are land animals, lacking gills or feathers, most of our lives we had to live ashore. Those years we rambled mostly on land - by foot, car, plane, or on rails. We did, however, make excursions afloat. Vacation trips included river runs by canoe or raft on all the inhabited continents, or boat trips within or along all the continents. -----We have roamed by water for extended times, sometimes years - afloat by kayak, canoe, raft, or boat. For two years we lived aboard a 20' sailboat and cruised her 13,000 nm along the waterways of America. During those years, we were ashore for only brief times to visit family or friends. -----For us nomads, we are sometimes questioned -- Which lifestyle is preferable - afloat or ashore? The answer is simple - neither! We find we need both, since both offer what we are fundamentally seeking - change. And each offers unique opportunities to experience change. -----Life afloat is filled with variety. Weather is always changing, the wildlife around us is seasonal and sporadic, and every anchorage and mile of water is unique and different. A lake is different from a river, and they both differ markedly from the ocean. Bays can be freshwater or salt, rocky or mud - and the wildlife and experience varies accordingly. On salt water, we rise and fall with the tide and we are offered different views as our 'home' swings on the tidal flow. The surrounding land may be beach, deep forest, or urban. On fresh water, current or winds swing us on anchor and the view from the cockpit is ever-shifting. Nomadic life afloat is continuous change. -----There are overlapping experiences for dwellers on water and those on land. But the perspective is sharply distinct, whether one is looking to the shore or from the shore. It is this perspective that is unique to the edges of either environment. -----Now we have the best of both worlds - land and water. 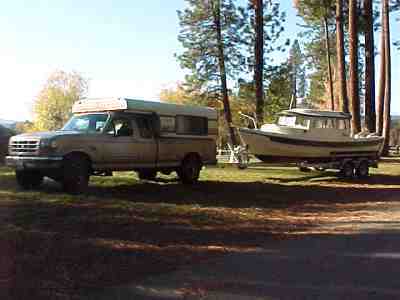 Ashore, we live in an Alaska Camper, mounted in the bed of a Ford pickup truck. The camper lifts hydraulically, has all the amenities, and is insulated and lined with wood - living in our camper home is 'boaty' and we love the spacious windows and comfort. When we have lived ashore in the past nine years, it has been in our camper. It has been from the Atlantic to the Pacific, and from the Gulf to the Arctic Ocean. It has been our home in every state and province, and in all three countries in North America. ......Views of mountains, ocean, lakes, saguaro, tundra, or whatever scene we wish. ......If the neighbors are noisy, or not noisy enough, we move our home. ...... We are self-sufficient. We generate our own power and properly dispose of wastes. 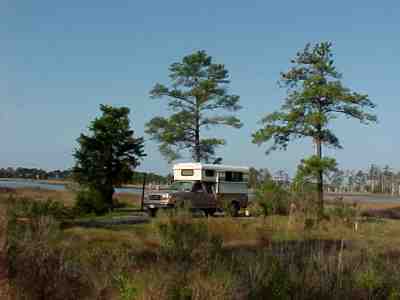 ......We can 'rent' a campsite in the most beautiful parks on the continent, or 'freedom' camp on public lands. ......There are no property or state taxes. ----- Afloat, we live in our other home - our C-Dory, Halcyon. 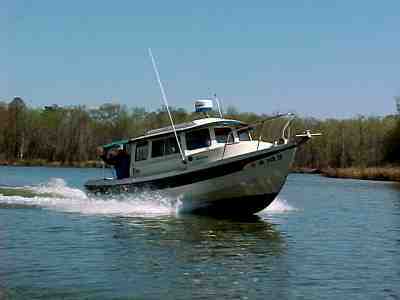 This small power boat is easy to maintain, is economical and simple to operate. It is trailerable - easy to load, transport, and launch. Therefore, it can go virtually anywhere as long as the water is two feet deep and navigable. This home can also have views of ocean, lakes, rivers, mountains and any scene possible on the waterways of America. Hey, and did you know? There are over 13,000 miles of interconnected navigable waterways in the eastern half of the US. We can still move to or from noisy neighbors, anchor in lonely coves or tie up at marinas and resorts in some of the most beautiful waterfront sites on the continent. And, we are still marvelously self-sufficient. -----With these two peripatetic homes, we have the perfect mode for nomads. We can comfortably sleep in either of our own beds and live in either home virtually anywhere on the continent or wherever there is navigable water. -----Sure, we could have a 42'-foot motor home or a Grand Banks Trawler and have more amenities, but for us nomads, think what that would sacrifice - our most precious asset - mobility. We can find a parking spot at the grocery store or downtown, and we can travel 4-wheel-drive into the Beartooth Mountains. Or, we can trailer the boat into Voyageur National Park or a thousand miles north in a few days if it gets too hot on the Gulf or a hurricane is approaching. We can park in lonely, lovely spots on the Mogollon Rim or anchor in the upper reaches of the Rappahannock, where the 'big ones' will never travel. And all we've sacrificed is some living space. -----Our first year with Halcyon, we traveled almost 7,000 nautical miles and have been in the Pacific, Gulf and Atlantic and many lakes and rivers between. Yet, we also were 186 days ashore living in our camper from coastal Texas to the Tetons in Wyoming, from the Cascades to the Appalachians. For wandering souls who love nature, we have had the best of both worlds - afloat and ashore. -----Most importantly, we have been adrift.